Since Madeline has requested it, I thought I would put together my own version of the 5 Essentials. I don't really follow trends actively, and sometimes I begin to feel that my style is getting a little stale or that what I like is no longer in fashion (which is probably truer than I care to think...), but these are the things that look good on me and make me feel good, and looking good and feeling good never go out of style. I know Madeline has already done the dark wash jeans, but I have to specify that I require a wide leg. None of this skinny stuff for me. I love wide-leg pants. There's just something about them that makes me feel put-together. I don't wear much jewelry. On any given day my wedding ring provides all the bling I require, so my clothes speak for themselves. It also helps if the shirt sweeps away from my midsection, since this is my biggest problem area at the moment. This is one item I'm sure is on its way out, but I have worn flats consistently for as long as I can remember. I love flats! They make my feet feel happy and look dainty. I prefer flats with an interesting pattern; polka dots, stripes, geometric shapes, etc. They command a little attention, but don't scream "Look at me!" or make my tootsies sore. I have a deep and abiding love of canvas totes and messenger bags. Anything that I don't have to treat with kid gloves and can stand up to some abuse. (It doesn't hurt for it to be machine washable, either.) It also needs to be expansive enough to lug around a book or two. You never know when you're going to end up sitting around waiting for something, so I always have a book in my purse. I think I am in love with dark denim right now, and the bag pictured is what I'm dreaming about at the moment. (It's for sale on Etsy, but I'm not going to tell you where in case I decide to buy it...) But any sturdy fabric will do. So... those are my 5 Essentials. Not really trendy, but I don't know that I could get out the door in the morning without them! I don't think I can begin to tell you how amazing I think my contributors are. Aren't they doing a wonderful job? I couldn't ask for better friends. I am having a great time in Alaska. I even saw a wolverine at Denali National Park (eat that, Napoleon Dynamite). But, I really am not connected to the net often enough to write great posts. Today I did see that Ali over at Chicibella is doing a great series on Fashion Trends with Staying Power. She is in the middle of the series, so check it out. Also, I saw this post at Budget Fashionista, about Delia's End of Season Clearance event, for up to 80% off. Hope you are all having lovely summers and doing lots of shopping! BOGO still on at Payless Shoesource, good through June 29th. Gap, Old Navy and Banana Republic are all having a huge summer sale. Remember that if you order from these retailers and Piperlime you get a combined low shipping rate for your order. For a limited time Gap is having a $19.99 sale on select men's and women's jeans, in store only. Reminder that Mars is giving away a coupon for a free chocolate bar to the first 250,000 people to sign up every Friday as part of their Real Chocolate Relief Act. And let's be honest, who couldn't use some free chocolate?! Go here this morning to sign up for your free chocolate. This special will happen every Friday through September. I love this outfit from Anthropologie and wanted to do it so I could actually afford it. The Anthro outfit rings in at a cool $520, while the look for less rings in just under $100. I might as well go ahead and admit that full skirts might be my favorite things in the world. They make me feel happy and feminine. Pair that with some flats, and I'm in heaven. I like coupling this bright skirt with a bright solid top and neutral accessories. Since the skirt is only available in plus and petite, I've tried to put it together to work for both body types. Both outfits are under $60. I love the dot detail on the skirt! Let me know what you think. A few weeks ago, my friend Amanda sent me a link to a Today show feature about every woman's 5 fashion must-haves. If you want to watch the video, the link is here. 3. Statement shoes that "elevate the outfit"
I read through this and decided that I don't own a dress I love, heck, I barely have a dress that I like. Also, I don't feel like my handbag is all that essential. (Although it is apple green and big enough to carry a small child, so I guess that makes a statement...) So, here is my list, customized just for me. A little footprint of my wardrobe if you will. You might be thinking, "Really? Essential?". Yes ma'am. I have a few of these and they are truly staples of my wardrobe. (Those of you who know me, can attest to this). I layer them under tees, sweaters, cardigans. Tuck them into pencil skirts, belt them. They add an extra punch to every outfit, and I feel fabulous every time I wear them. I have an undying love for cardigans (which my older brother has suggested I inherited from my father... and maybe I did). I wear them ALL the time. I have them in every color of the rainbow, in different weights, lengths, and patterns. Never underestimate the cardigan. I wear dark wash denim nearly every day. I wear trouser jeans and boot cut jeans at work and skinny jeans much of the rest of the time. I also believe that it is the most universally flattering wash.
You all probably know this, but I wear belts all the time. My waist is a part of my body that I really like, so I like to wear belts to show it off. I also love that belts make my wardrobe so much more versatile. What are your 5 essentials? Think about it then leave a comment! I am hoping that my wonderful guest bloggers will be telling you about their 5 essentials in the next coming weeks, so keep your eyes peeled! This post is a tribute to Madeline. Not that I am not a bargain shopper, but man Madeline is the queen at great finds! She does such an amazing job for finding you great looks for the best prices. This definitely takes some research, so Thank You Madeline for making our lives a little better and spending all those hours finding us the best. What do you guys think? Leave a comment! Shade Clothing is having their Summer Sale up to 70% off and free shipping with $50 purchase. Some of my favorites are the button-tabbed shorts and cute short sleeve v-neck cardigan. Get a coupon for a free Burt's Bees lip balm here, but hurry, there's only a few days left and they only give away 1,000 a day. The giveaway starts anytime between 9 a.m. and 12 noon EDT but no one knows exactly when! To equal the odds and give you the fairest chance at a free balm, they've randomized the giveaway to start anytime between 9 a.m. and 12 noon EDT. Mars is giving away a coupon for a free chocolate bar to the first 250,000 people to sign up every Friday as part of their Real Chocolate Relief Act. And let's be honest, who couldn't use some free chocolate?! Go here this morning to sign up for your free chocolate. This special will happen every Friday through September. I am flying to Alaska on Thursday, and am preparing to go. My friends have volunteered (very kindly) to help maintain my blog while I am away. Amanda: is one of the craftiest gals I know. Miss Amanda is always willing to undertake a project (and help you figure out how to accomplish it), and always willing to give me feedback about my ideas (and is always giving me great ideas of her own). Another bargain shopper to her core, Amanda is a kindred spirit of mine. Kristyn: always tells you exactly what she is thinking, and I love her dearly for it. She is the kind of friend you need to take shopping with you because she will tell you how it is. At our craft group, she is a resident paper crafter and is always sharing supplies and and making us laugh. Ali: knows more about fashion than I can pretend to know. She is wealth of knowledge when it comes to getting dressed as well as dressing a space. With impeccable taste, I am sure she will share some awesome ideas. Don't miss out on all they have to offer! This fabulous Merino Wool cardigan is on clearance over at J.Crew. I know some of you may be dealing with screaming hot weather, such as the ladies at Academichic. But here in SLC, it's crazy cool and rainy every day. A nice little cardigan goes a long way to warming you up on a drizzly day. So, I realize I have been totally out of the blogging world for a week. So, here's where I have been. I drove to Yosemite National Park from Utah on Friday (which was about an 11 hour drive, yikes!) We hiked the park Saturday and Sunday. Then Monday morning I woke up with a stomach bug that was working it's way through my family. While feeling under the weather, we drove from Yosemite to Moss Beach (South of San Francisco on the Pacific Coast) to the most amazing little Inn. It was amazing and mellow and you all should stay there if you get the chance. The next day (Tuesday) we drove to San Francisco, and tried to cram as much into 8 hours as humanly possible. 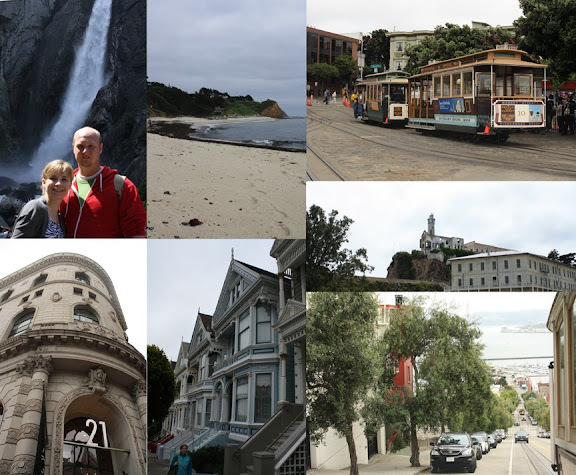 We took the BART, we walked from downtown to Fisherman's wharf, we did Alcatraz, and we took a cable car, and even saw the painted ladies (houses, not real ladies). Then we drove to Berkeley to some random Free-range/Vegan/Vegetarian Italian restaurant (which was really good). It was our 3rd Anniversary after all. And then we drove to Reno staid the night in a questionable Motel 6 and took I-80 all the way home yesterday. It was crazy. But it was awesome. At least I have an excuse that I haven't blogged right? I guess I am feeling really guilty about missing a week of posts because my annual trip to Alaska is imminent. 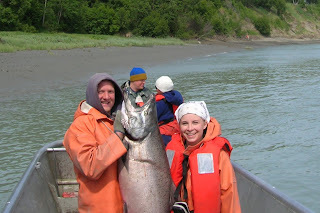 I am leaving for the commerical salmon season next week and will be ..... without daily internet access for 6 weeks! Not to mention my fashion inspiration will be over sized orange rain gear and goulashes. I will do my best to post at least once a week. And am hoping for a few friends to help me out with a few guest posts. So, please, don't give up on me! I am so happy to have so many faithful readers, you guys are so amazing. Thanks for allowing me to do this! I know I have been a little MIA this week. I have been working a lot of overtime. I am also gearing for a weekend trip to California and for my summer adventure in Alaska... details on that to come soon. I did find a great deal, to share with all of you. This amazing Petite Cotton Sateen Tiered Waist Jacket from Ann Taylor was $169 and has been marked to just $29.99! I have decided I am going to occasionally post non-fashion posts (mostly DIY projects) but still with a budget spirit to them. I am often doing fun crafts on the cheap, and am always wanting to share them. I found this tutorial on how to make your own stationary with left over wallpaper at Design Sponge earlier this month and my crafty friends and I set out to make our own. With our scanty budgets in mind we changed a few things. First, we went to the Dollar Store and bought sets of cards, 8 for $1 (instead of buying fancy blank cards somewhere else). We tried to get cards that were blank inside (but did buy a few that had cheesy sayings inside like, "Your kindness is special, and so are you"). None of us had any wallpaper hanging around, but my friend Amanda and I found rolls at Big Lots for just $2. Now, this wasn't wall paper I would ever actually put up on my wall, but in small stationary doses, was kind of fun. Our other friends had vast supplies of scrapbook paper (and were kind enough to share, thanks Kristyn!) Wrapping paper could also be used for this craft. We did try to get our hands on old wallpaper sample books, but apparently this is not as easy as everyone likes to say. I am still on the hunt though, because they would make awesome fodder for craft night. If the card had a saying inside we cut a solid mat for the inside of the card. At first, I thought these cards that needed mats would be the most tedious and I avoided them, but I found that I enjoyed the extra pop of color on the inside of these cards the very most. What do you guys think? Are you a DIYer? Do you try to be? Any ideas on what to do with 56 sq. ft. of interesting wallpaper? Leave a comment! P.S. You may have noticed a new button to the right. My husband is starting a band called Twenty Wells, it's country / folk. So, if you want to check it out, do. Thanks!